This is a free pattern from The Caron Collection (Caron-net.com). They offer quite a few really nice ones. My ANG CyberPointer’s chapter worked on ornaments using various types of stitching. My favorite was the Bargello Pine Trees. And, I love how it turned out. The top rows of Bargello are Fuzzy Stuff. 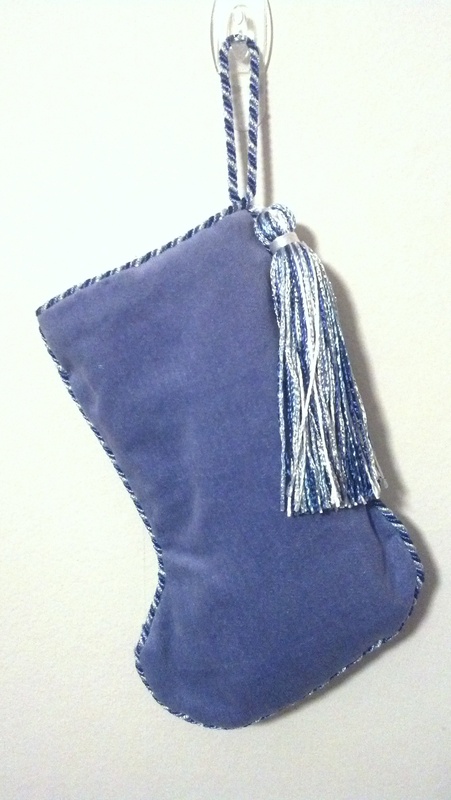 The finisher that Nimble Needle uses added the braid and tassels to match the darker blue but for the backing used a lighter purple that matches the center top motif. Just wonderful & is in plenty of time to enjoy for the 2014 holiday season. 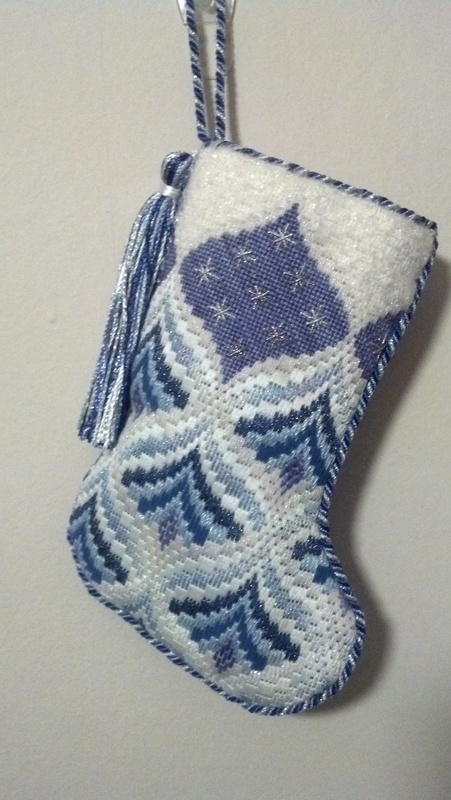 My ANG CyberPointer’s chapter started working on various ornaments using various types of stitching. My favorite was the Bargello Pine Trees. When I went into my stash, I found a coordinated packet of ThreadworX threads. I switched overdyed floss from my stash which was a light blue to match the other threads better. 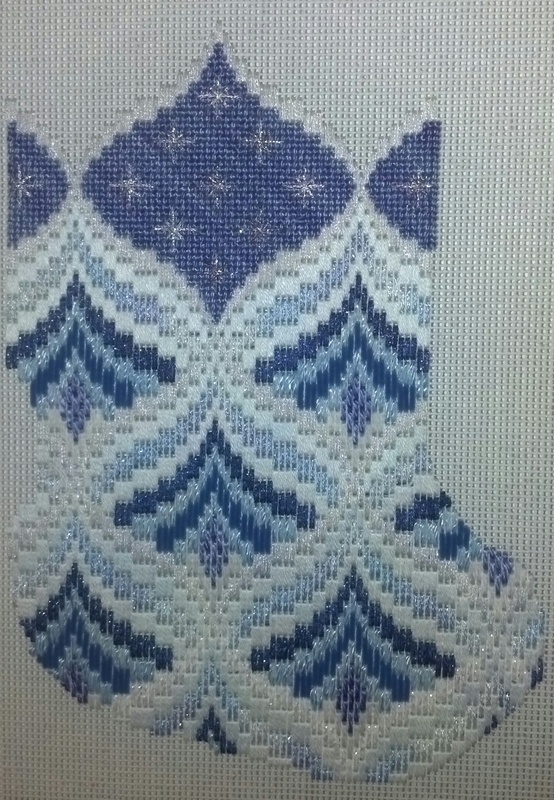 And, I needed a contrasting dark for a row so I used Petite Very Blue. The wild blue from The Legacy Collection that was polyamide just didn’t fit in this piece. I ended up using (from outer rows inward with ThreadworX unless noted): 2 strands #8 braid white (71124), 4 strands overdyed floss light blue (1018), 1 strand #12 braid light blue (91015), 1 strand Expressions medium blue (224S), 2 strands #8 braid dark blue, 1 strand Vineyard Silk (V118), 1 strand Petite Very Velvet dark blue (V634), and overdyed Italian wool white (W842). And, 1 strand of #8 braid silver (71122) placed on the upper section. As it ended up, I did run out of one thread & had to substitute but it really matched well enough. Can anyone see? I forgot to mention that this is a free pattern from The Caron Collection (Caron-net.com). They offer quite a few really nice ones. Taking a break from my current projects, I decided to work on this ornament as we enter the holiday season. As part of the ANG CyberPointer’s chapter, some members are working on ornaments and I liked this one best (since last year I’ve been wanting to get to it; http://www.caron-net.com/magfiles/magdecharts/magdech.html). Plus, I am in a Bargello phase. 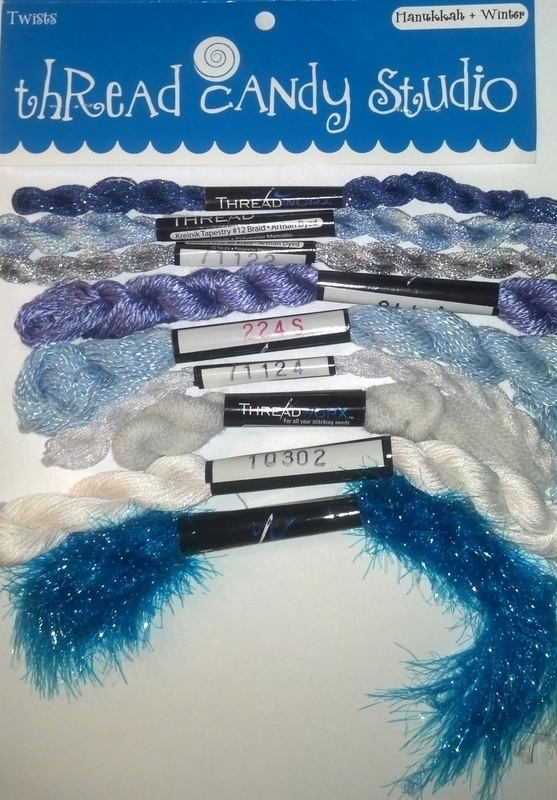 When I went into my stash, I found the packet of ThreadworX which is a beautifully selected bag of threads (for Hanukkah or winter) from Thread Candy Studio. Great combo of blues, purple, & whites. I picked up the packet at Annie & Company in NYC earlier this year (subject of earlier blog). I have found out that Bargello requires a thicker thread or multiple strands. So, I’m not sure there is enough in this bag. Well, I’ll figure it out as I go!